Anyone else fallen in love with Jamberry nail wraps - and now you really have no further need for nail polish? 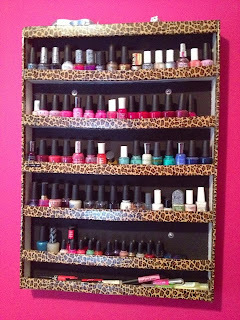 No big deal for me, but my sister and her four girls have shelves and drawers and bins full of all sorts of nail polish - and I wondered what she could do with it all when she discovered the wonders of wearing Jams on her nails instead! So I made her a list - now she won't be needing all that nail polish anymore!! 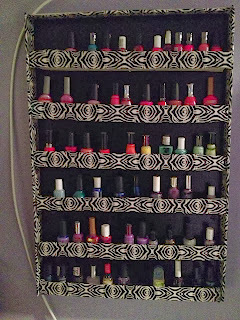 What do you do with all your leftover nail polish? Well, here are 60 uses you may not have thought of! 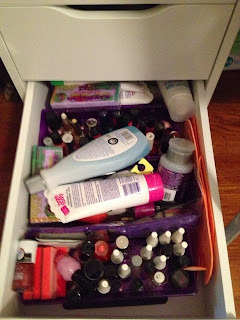 -- Brush clear nail polish over any label to make it instantly waterproofed! Use it on your garden plants sticks, or the labels on your shampoo bottles, etc. This also comes in handy when labeling expiration dates on your cosmetics. -- Fill those little nicks on your hardwood floors with some clear nail polish. When it dries, sand gently with 600-grit sandpaper. -- Use clear polish to stop runs/holes in your pantyhose. Brush the rip area with some clear polish. Saves the hole or run from getting any bigger. -- If your jewelry has a loose stone, you can re-glue it with a drop of clear nail polish. Quick drying, with an invisible repair. -- Got an envelope that just won't stick - or hate licking envelopes? Seal it with clear nail polish at each corner for an extra strong seal. -- Do you have a chip in your favorite lacquered vase or other lacquered item? Brush over the chipped area with a matching nail polish color to make it less obvious. -- Use black nail polish to re-mark the fine lines on a metal ruler or other tools; seal with clear nail polish. -- Got a small hole inside your cooler? Seal it up with a couple of coats of nail polish! -- Having trouble threading a needle? Dip the end of your thread into a small amount of nail polish - now it's easy! -- Splinters or nicks in your wooden hangers? Coat the rough edges with nail polish to keep your coat linings from snagging. -- Use clear to cover the tags on your pet's collar to avoid the color coming off and making the tag hard to read. -- Do you have a small in your window or door screen? Keep out the bugs and stop the hole from getting bigger with clear nail polish. -- Does your finger turn green from wearing a costume ring? Simply paint a thin coat of clear nail polish on your costume jewelry to prevent tarnishing. -- Window shade tear? Seal it with a dab of clear nail polish. -- Coat any metal that touches your skin with nail polish, to prevent a reaction. Reapply every so often. i.e. rings, jean buttons and belt buckles, etc. -- Clear nail polish on the tips of your wooden matches will protect them from rain or when you are camping. -- Coat the ends of your shoelaces or rope with nail polish to prevent it from fraying. -- Splinters in your wooden furniture ripping or snagging your clothing? Brush some clear nail polish over the problem area so you won't damage your clothing any further. -- Coat your screws in nail polish before using. This will give your screws a tighter fit and longer durability. -- Add a little glitter over top your Jamberry wraps for add glamor. Try adding glitter to a base coat for dimension and texture to your nails. -- Paint each of your keys with a different color of nail polish so you can quickly figure out which key is which! -- Want an easy/cheap way to model your shoes after the highly coveted designer brand, and give your shoes a fresh new look? Coat the soles of your high-heels with a bright nail polish color. -- Make a permanent mark in your measuring cups or buckets. You could mark how much soap you need and another level for how much water you need. I am going to use this to mark how much laundry soap to use in the cap. -- Scratched or scuffed shoes or boots? Brush on black, brown or red nail polish to match your shoes/boots! -- Use dark red nail polish to label the poisons in your cupboard. Draw a big X on the product label. -- Mark your ideal thermostat or shower heat settings. You will never take a too hot or too cold shower again. Mailing out a parcel on a rainy day? Brush clear polish brushed over the address information to make sure it doesn't smear, and your package goes to the right place. -- Put a dab of nail polish on the center of your buttons. This will prevent the thread from unraveling and losing the button. -- Keep those new toilet seat screws from rusting. Brush with a coat or two of clear nail polish; it also helps to prevent seat wobble by keeping the screws tight. -- Use stencils and masking tape to make your initials or artwork look perfect. -- Brush a coat of clear nail polish on your belt buckles to prevent oxidation and keep it gleaming. -- Glamour up your necklace, ring, or earrings by covering parts of it with a pop of color, such as neon green, orange, or pink! Match your outfit! -- Get rid of a wart (including planters warts) by covering it with nail polish. Your wart will be gone in about a week's time. You should throw away the polish you have used though, to prevent the virus from spreading. -- Coat your delicate pearl buttons with a protective coat of clear nail polish to help keep their brand-new sparkle. Keeps costume pearl buttons from peeling as well. 35. Feeling artsy? Paint with nail polish! -- I've painted picture frames, bookmarks, bobby pins, paper, rocks, shells, etc. -- Tame those fraying strays from the bottom of your skirt, cuffs of your jacket, or edges of your purse by brushing them with some clear nail polish. -- If you get bug bites, dab some clear nail polish on the bite to stop it from burning and itching. This remedy isn't exactly scientific, but it does work. Don't use if you have any open scratches. -- Brush the cut ends of gift or hair ribbons with clear nail polish to stop them from unraveling. -- You can paint your phone with sparkly nail polish. Work on a simple phone case too! 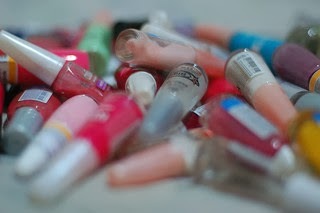 -- Apply nail polish to anything at risk of rusting, in the bathroom, or outdoors. i.e. a metal can causing rust rings on your bathtub? Apply a thin layer of nail polish to the bottom. Keep chipped car paint from rusting by coating the damaged areas with nail polish. -- If you split a nail, grab an unused tea bag. Cut the tea bag open, dump out the tea leaves, cut a piece of the bag into the shape of your nail. Cover with clear nail polish. Press it onto your nail, then apply your favorite Jamberry nail over top. Perfect! -- Use this trick to extend the life of your glasses. Do the screws on your glasses, or your kids' glasses kept working loose? After you have tightened them up, apply clear nail polish over the screws. You can use acetone to remove the nail polish if they need adjusting. -- Got a small crack in your windshield? Stop it from spreading with some clear polish. Start out in the shade. Brush the windshield crack on both sides of the glass with polish. Fill the crack well. Move into the sun till the windshield is dry. You will still need to repair your windshield, but this will give you time without further damage. -- Have a mirror or glass pane with nicked edges? Brush a thick coat of clear nail polish to soften the sharp edge. -- Brush some glow-in-the-dark nail polish on the buttons of your TV remote. You'll never press the wrong button again! -- Do you find store clerks have trouble swiping your credit and debit cards? Brush clear nail polish to the magnetic stripe - it should work again. -- To avoid confusion, place a dot of bright polish on your golf balls. Use this for all your other sports gear you can't write your name on. Now you will always know which one is yours. -- Use nail polish to mark your cups/mugs on the bottom so your kids won't fight over them! Use nail polish to mark your family toothbrushes so they don't get mixed up. -- Want to cut back on salt? If your salt shaker dispenses too much salt, simply paint over a few holes on the lid with nail polish. -- Someone faints or loses consciousness, and you don't have any ammonia near you to wake them up? Put a bottle of nail polish under their nose. The strong chemical fumes should be enough to wake him or her up. -- If your kids get matching toys, put a different color of nail polish on each toy, so you know whose is whose. No more fights! -- Protect the important information on your prescription medicine bottles and other important medicine labels with a coat of clear polish. Now it won't get smudged when your hands are wet or sweaty. -- Brush clear nail polish on the itchy red bumps of swimmer's itch to kill the organism and stop the itch. -- Brush red nail polish on the 'top' side of the charge plug to your cell phone and/or iPod. Makes it easier to plug it in, in low light conditions. -- Brush bright red nail polish to mark the switch to the garbage disposal. -- Use bright nail polish on your computer connections. Brush the top side of a computer hole and the top side of a plug, both with the same colored polish. Now you will know what belongs where and where's up and down when you go to plug in. -- Paint the flash button on your telephone so you can find it quickly - without reaching for your reading glasses. -- Made beads from Fimo clay and decorate them with nail varnish after baking. So much cheaper than buying the proper stuff, with more color choice! -- This one sounds yucky, but apparently it works. Apply nail polish to the affected area every day. It will take about eight days to resolve the problem. Be sure to use a new cotton swab to apply it each time, so you don't contaminate the polish jar and re-share it. -- Run out of Modge Podge? Brush clear nail polish to the back of the image you want to decoupage. Apply the image to the surface, smooth down just like you would with Modge Podge. Then brush clear nail polish over the top of your image. Let dry.